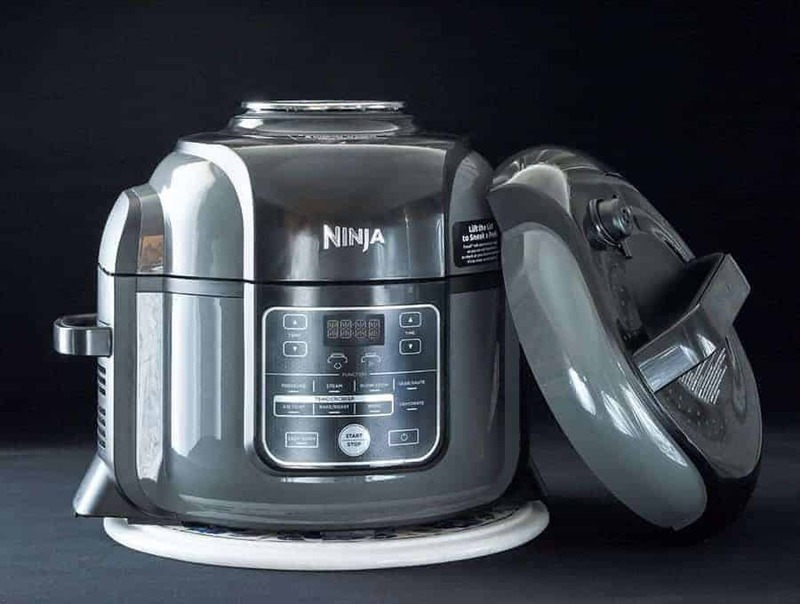 Are you curious about the Ninja Foodi, a pressure cooker, and air fryer combination device? Recently I did a Ninja Foodi Review and wanted to share my results with you. It’s an air fryer/pressure cooker combo so it piqued my curiosity. I knew I just had to see how it worked. This is my unbiased, non-compensated review of the Ninja Foodi. I did a full Ninja Foodi review video you can watch to see how I used and cooked with the Ninja Foodi. using it both as a pressure cooker and as an air fryer and how that works in a single device. I would recommend you watch the video for more details and to watch me make a recipe in it. But this post also summarizes my review for the Ninja Foodi..
HOW DOES IT WORK AS AN AIR FRYER AND A PRESSURE COOKER IN A SINGLE DEVICE? This was the question I wanted answered more than anything else when I decided to do the Ninja Foodi Review. How does a single device operate as an air fryer and an electric pressure cooker? The simple answer is that it has two lids. One lid is separate and for the pressure cooker portion of the device. The air fryer has its own lid that is attached to the device by a hinge so when it’s not in use it’s out of the way of the Foodi. IS IT SIMILAR TO OTHER PRESSURE COOKERS AND AIR FRYERS OUT THERE? Yes. 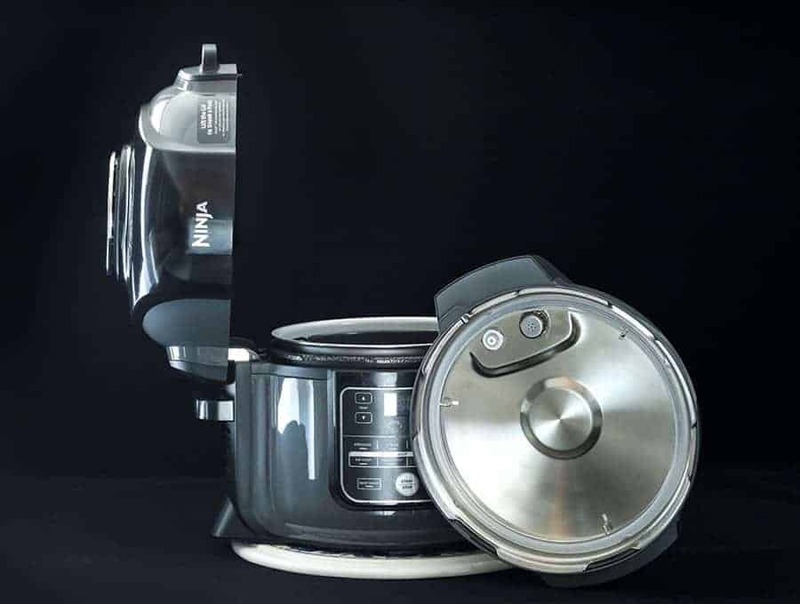 If you’ve used other pressure cookers or air fryers, using this device will be very easy, and you should have little to no learning curve at all. It has all the familiar buttons you’re used to, making it simple to cook with. For the recipe I made in my Ninja Foodi. review video, I cooked an entire meal in one pot and it came out perfectly. This is especially helpful for recipes that could benefit from both the pressure cooker function and the air fryer function because you don’t have to move the food from one device to another. One thing to note, however, is that this also has a Bake/Roast function. So in addition to serving as a pressure cooker, an air fryer, a steamer, AND a slow cooker, this device is also a small portable oven. This could make the device quite a kitchen powerhouse device if you used all the features of the Ninja Foodi. WHAT IS THE BENEFIT OF A Ninja Foodi.? Obviously, for me, the air fryer and pressure cooker are two devices I use often. 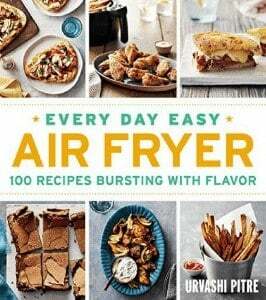 I have three Instant Pot cookbooks out and have recently finished my first air fryer cookbook that has 100 recipes in it made with real ingredients (you can pre-order that HERE), so both of those appliances are used frequently in my household. Having both of those devices in one appliance is incredibly convenient for me, and also saves counter space. This is a large device, but since it’s two devices in one, even with its large size it still takes up less room than two devices would. This would also be convenient for small kitchens, dorm rooms, or for those who travel a lot. Plus it’s one less device you have to clean at the end of the night, which is a big plus for me. Efficiency is key. WHAT ARE THE DOWNSIDES OF A NINJA FOODI? I think the downsides of combination devices are that if one function breaks, you may be looking at having to replace the entire device, which is not fun. Secondly, you can only use one device at a time. So I often have one thing going in the air fryer, and another thing cooking in the pressure cooker. with this, you would have to cook such items sequentially. The fact that the lids are big, and that you’re storing two separate lids may be a deterrent for some people. Luckily one of the lids is permanently attached, but the pressure cooking lid still needs a home. My vote is yes–if you have the room. It is much larger than any of the other pressure cookers out there. I also vote yes if you make recipes or would like to make recipes that involve first pressure cooking, and then air frying, such as my https://twosleevers.com/crispy-pork-belly/Air Fryer Lechon Kawali recipe, or if you want to brown the tops of desserts, or my Gyro recipe. I’m very pleased with this purchase and think it will save me a lot of time for those recipes that use both functions. It’s also very roomy. I was able to cook half a chicken with rice and eggplant with MORE than enough room so this would even be usable by large families. I’m still learning about this device, as it’s new to me. Feel free to ask questions in the comments below, and as I learn more about the device I can answer them there.